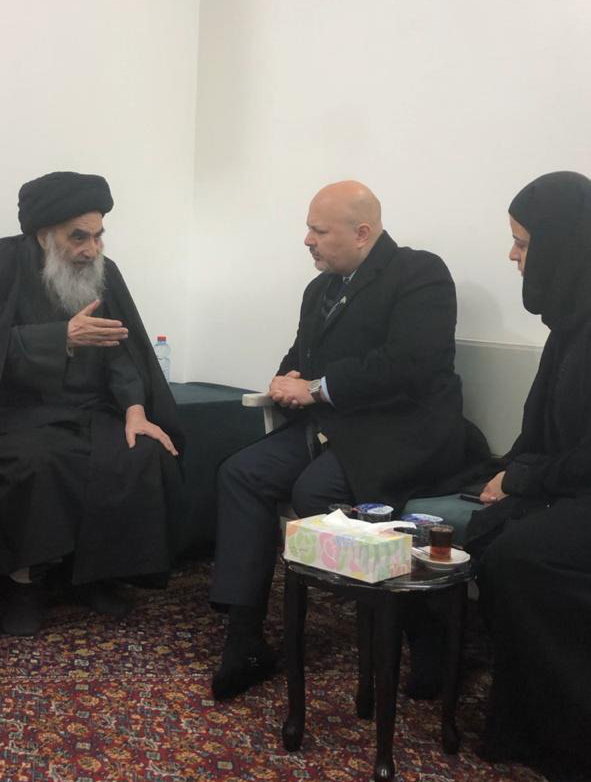 Najaf, Iraq – His Eminence Sayyid al-Sistani welcomed Mr. Karim Khan, the United Nations (UN) Special Advisor and head of the team investigating crimes by ISIS, and Ms. Nicole el-Khoury, who is the team’s legal expert, in his office in Najaf, Iraq, on Wednesday, January 23, 2019. His Eminence welcomed the formation of this international team and affirmed the importance of documenting the crimes of ISIS, as was done previously with Nazis crimes. Moreover, Sayyid al-Sistani stressed the importance of holding the perpetrators accountable and informing the world of the serious danger of this terrorist group against humanity as a whole.